On Sept, 29, 2017 Greencore, USA, LLC initiated a voluntary recall of egg salad sandwiches, ham salad sandwiches, and seafood stuffing. The products are being recalled because Listeria monocytogenes was found in environmental samples collected by the FDA. On Sept, 29, 2017 Greencore, USA, LLC initiated a voluntary recall of egg salad sandwiches, ham salad sandwiches, and seafood stuffing as listed below. The products are being recalled because Listeria monocytogenes was found in environmental samples collected by the FDA. Additional FDA sampling of finished product tested positive for Listeria monocytogenes by FDA. No new lots of products are being recalled. Greencore is investigating the cause and has implemented corrective actions. As of September 29, all customers have been notified and instructed to remove and destroy impacted product. No product should be available for sale. 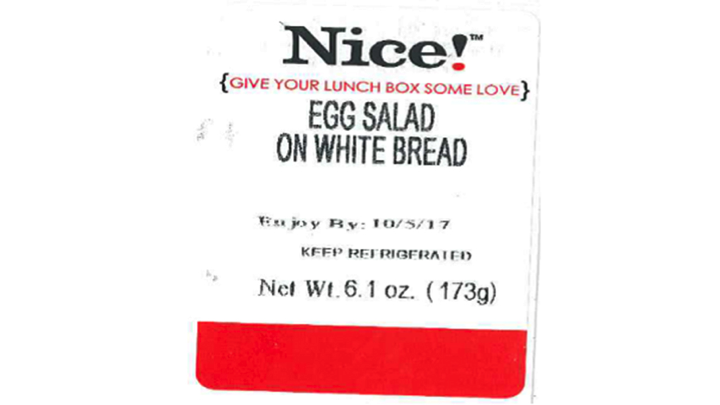 Consumers who have purchased these sandwiches and stuffing are urged to not consume the product and should dispose of the recalled products. Anyone concerned about an illness should contact a healthcare provider. Greencore is recalling lots distributed between September 24 and 27, 2017. Sandwiches were only distributed to American Food and Vending, Hannaford Brothers, Target, and Turkey Hill in Massachusetts, Rhode Island, Connecticut, Maine, Vermont, New Hampshire and New York. The “Use By Date” of sandwiches is listed on the back panel of the sandwich. In addition to fresh ready to eat sandwiches, Hannaford Brothers Seafood Stuffing is being recalled with Lot Codes between 10/2/2017 and 10/19/2017. Customer Product Size UPC Code "Used by date"
Customers may call Greencore at 630-786-2011 between the hours of 9 am and 5 pm (CST) for more information.